As the recession turns worse, twofers, buy one and get the other one free is now becoming one of the popular measures to lure cost conscious customers. When twofers was adopted by pharmaceutical companies, combined drugs are their answers. Let me show you the successful outcome. Unbalanced dieters should take many different types of Vitamines as the supplements, and if they are combined in one pill,and still cost efficient, no one can resist buying it. But it is also true under the recession, pharmaceutical companies are producing unlikely drug concoctions, which you cannot help wondering truly good for your health. Let me introduce you one of the cases. A combined drug for erectile dysfunction and high cholesterol. I prefer to have them separately according to my health. Sad to say,this is the tip of the iceberg of their fancy drug concoctions. Can you believe pharmaceutical companise really wish to develop a trusting relationship with you? 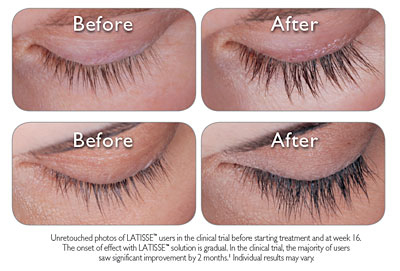 For the beautification of eyelashes, making them longer, thicker and darker, LATISSE solution is widely prescribed at esthetic clinics. But to be honest, this eye solution is not developed for the treatment of hypotrichosis,sparse eyelash. Ingredients in this medicine help lower IOP ,Inter Ocular Pressure. This eye solution is used for the treatment of glaucoma. Changes in eyelashes are one of the side effects for glaucoma patients and IOP reduction vice versa for esthetic clinic patients. For instance when blood pressure is lowered by medication , severe side effects such as dizziness, confusion and slurred speech are reported. So what will happen with IOP lowered eyes? IOP has the power to keep retina attached to the eye ball from inside. softened eye balls might be more vulnerable to ocular trauma, bringing a dangerous outcome or even possible retinal detachment. Before the use of LATISSE solution, an eye check with your opthalmologist is advised. Hi! I'm a ophthalmogist running a outpatient clinic in Japan. Yesterday I had the visit of Pfeizer MR for the campaign of new glaucoma eye drop,Xalacom which has been already on sale in the world nearly decade ago. But Xalacom,combination eye drop of prostaglandin and B-blocker would be a potential ocular pressure depressant,but at the same time, precaution should be taken to prevent both type of side effect. Especially B-blocker eye drop is known to cause deadly side effect like cardiac arrest in heart disease patients. Once you start to depend on this strong additive effect of Xalacom, it's pretty difficult to think about early withdrawal,resulting in the prolonged use . So we should take care of not only the control of ocular pressure but also the side effect of prolonged use of B-blocker on heart disease patients. The merits of the combination eye drops are the higher compliance enabled by once a day use, and the more cost efficient than buying two eyedrops. But considering the nature of glaucoma,higher occurrence of visual loss, it is a big question that the merits brought by the combination eyedrops are truely beneficial for glaucoma eye. Instead of Xalacom, if we use two eye drops, of course not so time saving and cost efficient . We can control the eye pressure of glaucoma eye more finely. When you see too much ocular pressure drop,you can stop using one . In case of of combination eyedrops, we would like to have something more than the additive effects of two eyesrops . We should select the best pair of two eyesrops that will give us further benefits which cannot be obtained by independent use of eyedrops.